Since John caught my cold a few days ago, we bowed out of a dinner invitation, unsure as to whether he would feel better in time or not. Of course, neither of us felt like cooking on top of unpacking endless boxes from our move so we took up a reservation at Cactus Creek Prime Steakhouse for our Thanksgiving Dinner. The cozy, sit-down restaurant in the north part of Reno had great reviews of their prime rib but we were there for our Turkey Day dinner. 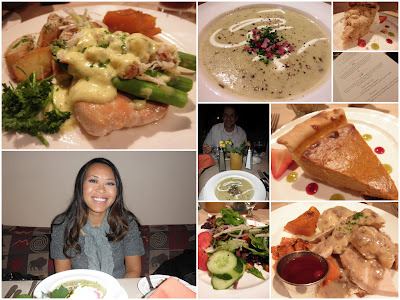 There were two dishes on the holiday menu so we tried each one. John started with the Cactus Creek house salad (the Tequila Lime house dressing was fabulous!). Followed by a hearty helping of slow roasted free range turkey, giblet gravy, Granny Smith apple and sweet Italian sausage dressing, whipped Yukon Gold potatoes, citrus candied yams, Chef's fresh winter vegetables, and cranberry sauce. I chose the fire roasted artichoke bisque, prosciutto, chives and creme fraiche. The main course was a breast of Chicken Oscar...butter sauteed breast of chicken topped with fresh asparagus, mounds of Dungeness crab and bearnise sauce, with a side of fingerling potatoes and roasted squash. The caramel apple pie and pumpkin pie, each with a scoop of ice cream and a cup of coffee was a perfect end to our dinner. It was a lot of food...and the best part was no cooking and no mess to cleanup! Grateful for our day, we counted our blessings. We sure do have a lot to be thankful for.